The award will be presented by Chancellor Blumenthal at the Staff Advisory Board's Staff Appreciation Picnic on Tuesday, May 10. McCawley has worked at UCSC for nearly 30 years, starting as a frontline advisor in the Admissions Office. He initially was shocked at the news he'd received the award, but then "very deeply honored," he said. "It's very meaningful to me." "I really believe in what we do," he continued. "I really enjoy working directly with students and faculty. We have an amazing staff. There is really something very positive about the work we do, and it can be life-altering. As long as I keep that passion, I'll be doing the work." Nominators praised McCawley's passion and commitment to his work and to the campus; his tireless dedication and patience, even in the face of seemingly insurmountable tasks; his initiative and innovative approach to problem-solving; his professionalism, fairness, and expertise; and his collegiality, sincerity, and warmth. He was instrumental in helping the Admissions Office through the long process of conversion to the new Academic Information System, and over the years he has implemented changes to the office's processes that allow students greater opportunity and access, according to nominator Tina Oberlin, senior admissions evaluator. He leads two UC systemwide endeavors that involve the other campuses: one that has positively influenced frosh from underrepresented and underserved backgrounds, and one that has helped transfer students from the California community colleges. McCawley leads by example, modeling integrity, honesty, equity, and fairness in his management style, wrote nominator Elaine Rivas, operations manager in the Chancellor's Office. "He believes that his staff should always be equipped with accurate and up-to-date information and the resources and training required to perform their jobs and represent the campus in the best way possible," wrote Rivas. In addition to a keen work ethic, deep knowledge of the campus and the admissions process, and strong leadership, McCawley is a compassionate and caring administrator, wrote nominator Debbie Belville, coordinator/advisor in the Linguistics Department. "I have seen him time and time again sincerely support staff through very difficult health and family times, putting aside 'the work' when there was something more important at hand," wrote Belville. 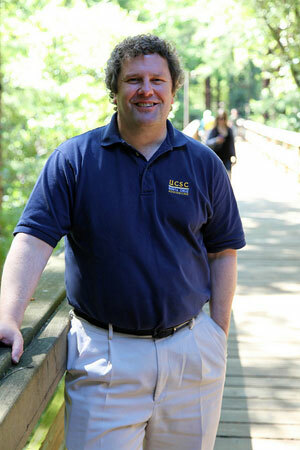 Established by the Alumni Association in 1995, the Outstanding Staff Award is presented annually to a staff member to recognize sustained, distinguished service by staff to student life, the growth and improvement of UCSC's programs, and the preservation of UCSCs unique intellectual and physical environment. In collaboration with the Staff Advisory Board, the Alumni Association honors the very best among UCSC's dedicated staff.